Rodney Robinson took fourth place in Nationals in his weight class. From left are Coach John Daugherty, Robinson and Coach Derek toro. Photos by Michelle DeMattie and Marsha Daugherty. 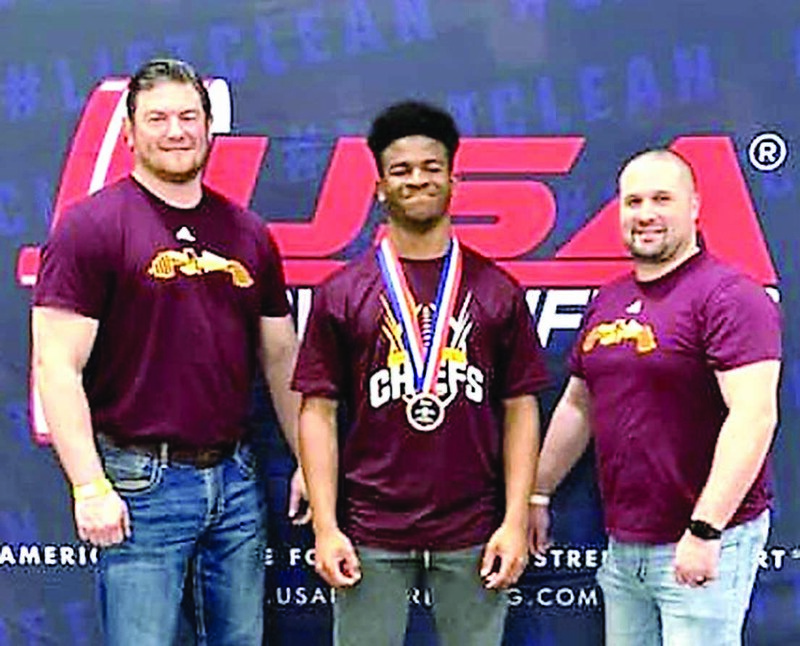 This year, Natchitoches Central had four lifters qualify for the 2019 USA Powerlifting High School National Championships in Alexandria March 29-31. They were seniors Tucker Henderson and Sara DeMattie, junior Rodney Robinson and LSMSA sophomore Paige Delsa . The Chiefs earned fifth place in the nation for Men’s-Women’s Combined Varsity Equipped and two lifters earned individual medals: Paige Delsa, fourth place, and Rodney Robinson, fourth place in their respective weight classes.